When I started studying in the UK, I bought two Japanese knives. These were GLOBAL Kitchen Knives by "YOSHIDA METAL INDUSTRY CO., LTD."
The Company is located in Tsubame City, Niigata Prefecture which is famous for their metalworking industry. The Knife's characteristic is to be all stainless steel from blade to handle. I could relief stress during my study with cooking everyday dishes and meals. 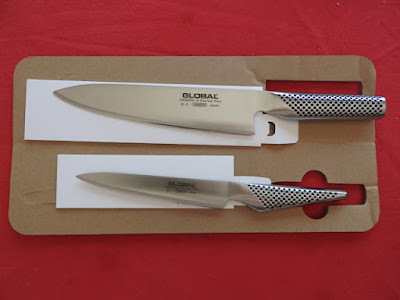 GLOBAL Kitchen Knifes were part of my study abroad life. I took care of them myself, I used them even after my returning home to Japan, but they were pits in the blades and they were no longer sharp. When I thought about buying new knifes, I found that there is a service (with charge + delivery cost) for re-sharpening from the Internet : ★ and I requested them. Sharpening was over, they came back. They were sharp and I am very satisfied. The company gave them engravings without charge.